TrishyB says: 46: chicky book alert! About ten years ago I saw a sketch on a short-lived comedy show with an all-female cast. The sketch starred Terri Garr as the hostess of a book group that was getting together to discuss The Bridges of Madison County. Terri Garr wears a big denim shirt and a bandanna. She fusses about the livingroom. The other women in the book group arrive and they are also wearing denim shirts and bandannas. Not having read the book, I didn't quite get the joke, but it became clear as they discussed the book, with the whole thing degenerating into a fistfight over who was most like the woman in the book. 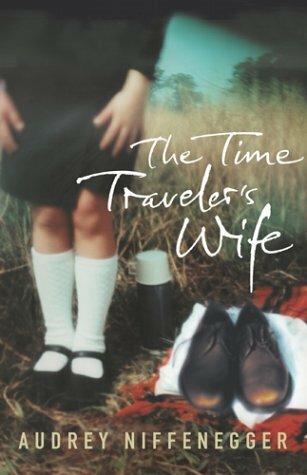 The Time Traveller's Wife is one of those books too, I suspect. Not satisfied with simply reading it, some women will try to find themselves in it because the lives of the people in it are kind of imaginable in the similarities to us, but impossibly remote and desirable in their differences. And yes, it is a very chicky book. Which is not to say there's a lot of kissing in it (although there is) and nothing to interest the blokey reader. But it taps into exactly the same romantic desire as the film of Last of the Mohicans and Truly, Madly, Deeply - namely, the desire to have a man who will always find you. Who will always come back to you and do everything he can to make sure that you're okay, no matter what's happening or where he is. And if he ever can't get back to you, you can be damned sure that he is bloody well trying. My only problem was that I found it a little hard to throw myself fully into the romance of it all because Henry (the Time Traveller), kept reminding me of Eoghan Barry at odd moments. The obsessive running. The playing of loud music. The wearing of t-shirts with band names on them. The love of spending hours in the kitchen making elaborate meals. The overachieving family. The swearing and drinking. You get the picture. Read this one and really enjoyed it. Passed it on to Marshall who sobbed like an infant while reading it as we sat waiting for a flight to check-in. Chicky, yes. Thankfully our enjoyment was un-sullied by associating anyone we knew with Henry. I don't know any obsessive runners. There you are, you see. And Stevie is a boy, who likes football and everything! I too had a big cry at various points throughout the book. I suspect this might be partly due to two external factors. One, my husband is away and I miss him. Two, I cry at bloody everything. That...could describe anyone. Well, almost anyone. Mind you, Celeste loved it. I read it and finished it, but I thought it was a pile of maudlin chickylit. For the reasons that you outlined. What is it about women that they need to have a man like that? We're not that fantastic that some bloke should spend his eternity looking for us. I wouldn't do it for a bloke. Having said that, I really liked the male character. Well written. Is it also like The Last of the Mohicans in that it features lots of lovingly rendered 18th century battles? Ooh, now we want a film with Alan Rickman in the role of Henry. I could take Sam to that and I'd be SO in.